Sunday Beach Volleyball for Fun! 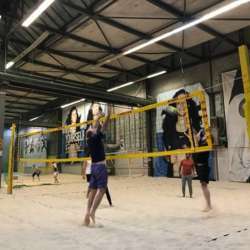 You must be a member of the Duesseldorf Beach Volleyball Group to attend this activity. Would you like to join this group? Let’s start the new year resolution with more beach volleyball even though it is cold and rainy outside, we can still enjoy the fine sand of Protected content . Wecan feel the sand under the feet and think about summer... Protected content level is welcome..-))). This time it will be on 1 field inside. Minimum 4 players to maximum 8 players per court. Any person extra on the court would cost extra Eur 3,00 per person. 1 court costs Eur 29,00 for 45 minutes and Eur 47,00 for 90 minutes. Costs will be shared by the number of attendees. Please only register if you can really make it. Otherwise please cancel 24 hours prior so that another person has a chance.